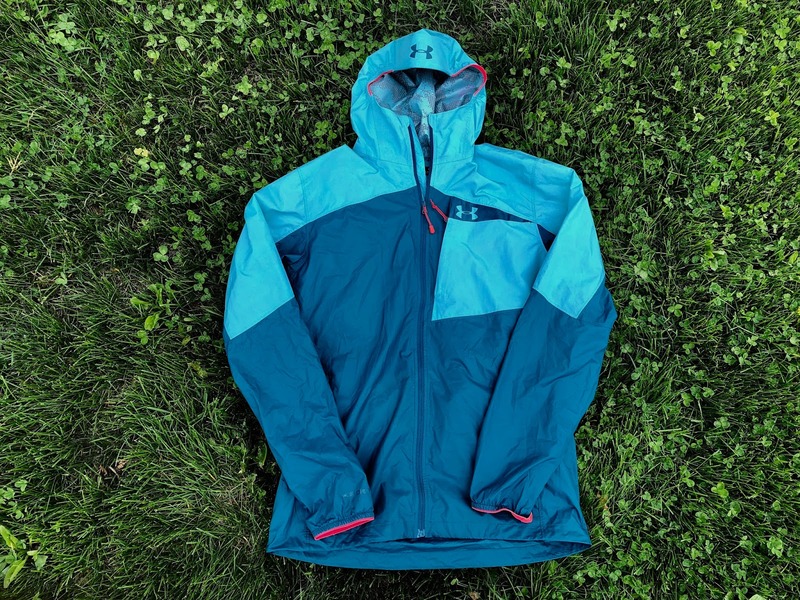 We have been impressed with Under Armour's new run and mountain focused apparel. We recently tested the ColdGear Reactor Exert (RTR review) which has proved to be one of the most versatile, broad temperature range, light insulation options we have ever worn. We were eager to see what UA had come up with in outerwear. Jeff: This hybrid jacket comprises of two different materials, strategically arranged and constructed to achieve a balance between waterproofing key areas, while maintaining breathability. The hood, shoulders and upper sleeves are made of Pertex Shield+ 2.5 layer laminated waterproof breathable fabric that effectively deflects falling rain and snow, while the remainder of the jacket is made of a more breathable single weave fabric that deflects moisture and wind effectively, but is not as impermeable is the Pertex Shield 2.5. 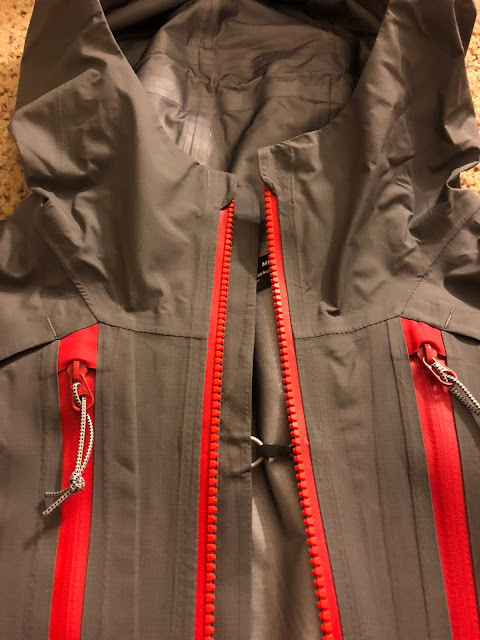 The Scrambler Hybrid is packed with usable features such as hook closure below the neck where the jacket can be unzipped and worn in a cape like fashion using the small red mid chest clip shown below. It also has a phone "seat belt" in the chest pocket, a mold-able hood brim and also stashes in one of the generously sized hand pockets for easy pack/carry options. Fit is a great balance of athletic and not too baggy, but with enough room for ease of movement and layering underneath. I found the Scrambler Hybrid to be a fine choice when it is snowing or intermittent light rain. It is reasonably breathable during low to moderate output activities, but during high output ascents in the rain or snow, I did soak the inside with perspiration, while the rain/snow would eventually soak through. It did however retain enough heat and block me from the wind enough that I was comfortable for an hour or two in temperatures ranging from high 20's to mid 30's. In dry conditions, the Scrambler Hybrid is great for colder days in the wind and without ambient moisture, I found that I stayed reasonably dry even on high output climbs if I unzipped and used the cape feature, which kept the jacket nicely in place. Once on a summit, I zip up for the downhill and stay quite comfortable. Sam: I liked the somewhat old school windbreaker look, reminding me of the original Bill Rodgers running jacket from way back when. 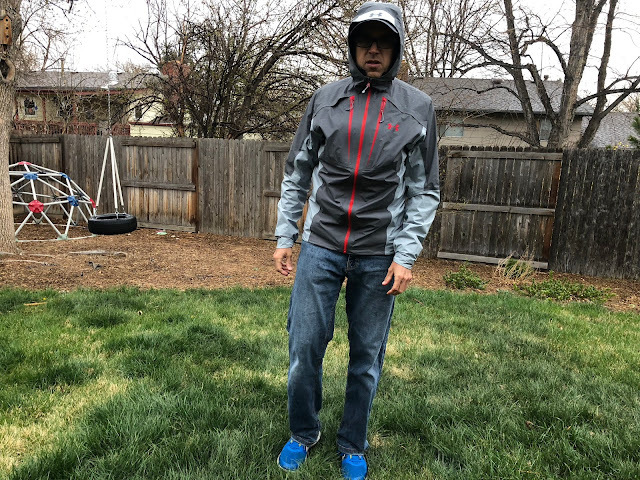 I found the Scrambler to work best in cool, damp, windy conditions on my flatter seaside runs as the combination of waterproof breathable shoulders and old school like windbreaker ripstop below kept the wind and chill out and kept warmth in. It's temperature regulation was excellent in cold windy weather layered over the UA Reactor Exert. I agree with Jeff that during high output climbs it is warm but zipping it down and having the chest clip hold it cape style was effective. Tip: attach the clip before you start as it is very small and hard to grab with cold hands or gloves. Sam: The closest comparison is to the Salomon S/Lab Hybrid Jacket ($275) (RTR review). It to uses a Pertex Shield 2.5 water proof breathable fabric over the shoulders with breathable fabric below. The anorak style S/Lab Hybrid is an ounce lighter, has a wide stretch waist band to keep it snug into which it can be rolled into on the run. It shares a chest strap clip (much easier to attach and a snap) with the Scrambler so it can be run unzipped. Its hood is superior in that it has an integrated head band to hold it in place, catch sweat, and if need be provide a touch of warmth even when the jacket is unzipped. It has no pockets. The Scrambler is a "warmer" and somewhat more protective jacket and has those three pockets. 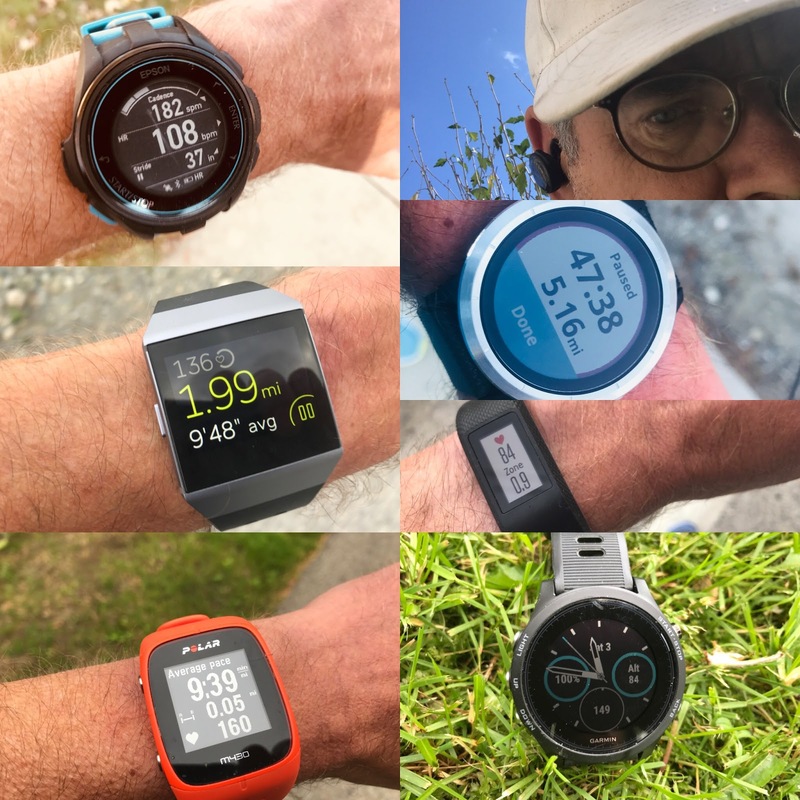 For pure running in a wider range of conditions short of heavy cold rain the S/Lab is superior, for practicality on the run and otherwise and value nod to the Scrambler. The Atlas Gore Active Jacket is very thin, light and is yet another outer shell where Under Armour has paid great attention to detail. 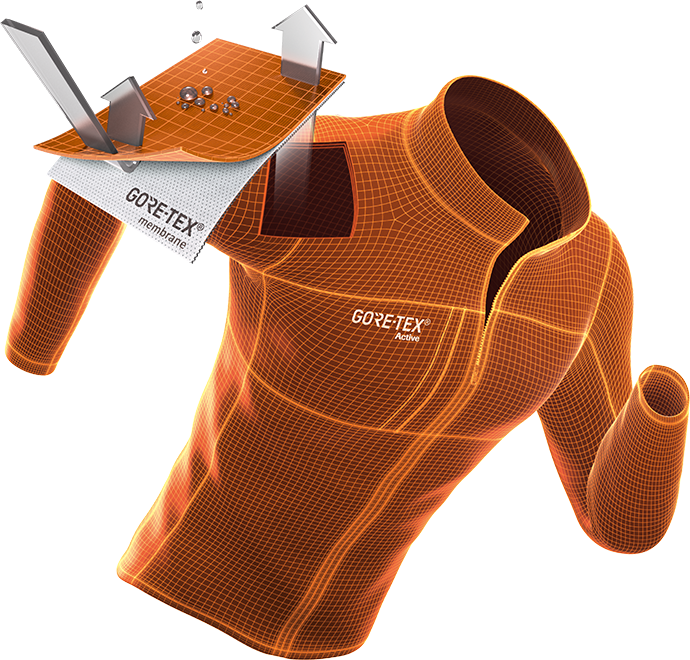 Below is a detailed technical description from Gore Tex on how the Active Membrane works, which they explain much better than I could. I can however give accurate commentary on how well it works in the field under real world circumstances. 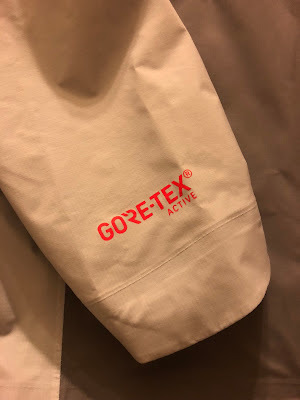 I found that the Gore Active membrane with taped seams, repels moisture remarkably well and did not soak through during runs as long as 2 hours in steady rain and the water continually beaded up and dripped off. Though there are small venting ports on the front and back of the shoulders, I found that despite Gore Tex's lofty claims of breathability are a bit exaggerated. Under "intense aerobic demands", like any jacket that claims to be waterproof and breathable, it wets out from the inside. Aware of this reality, I layer accordingly underneath and prefer long wool layers that, once wet, do a better job at retaining heat. It is also key to keep moving, at least when it is cold. The Atlas Gore Active does a great job however keeping that body heat in while wet and prevents the colder moisture on the outside from creeping in. 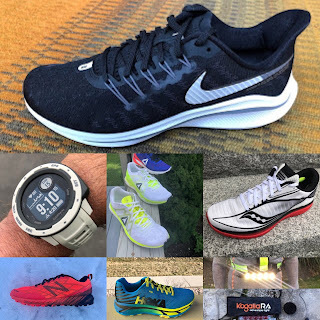 The fit of the Atlas is definitely on the slim, athletic side of the spectrum, which does not allow for much room underneath for layering, but generally range of movement is good. If you think you might want to use more than 2 thin base layers and add a more substantial mid layer, such as the UA Reactor jacket , you might want to consider sizing up. The hem of the Atlas also has a draw cord to tighten up and keep out drafts. The sleeve cuffs have a bit of elasticity to fit over your hand, under layers and even a bulky GPS watch and snug enough to keep drafts out. The hood is structured with a sturdy, yet mold-able visor and holds in place well in windy conditions, aided by elasticized draw cords at the back of the hood and inside the perimeter of the hood. The two "Napoleon" chest pockets are roomy and are easy to access, great spots to keep a phone, gloves or beanie. The left one has a clever "seat belt" to keep a smartphone in place, as well as a port for a headphone wire. The opposite pocket doubles as a stuff sack, which is generous in size and easy to stuff without much time or effort. The main full length zipper is large toothed and somewhat rough to operate, but seems durable. Below you can see the cape clip and nice zipper garages. In the photo below, you can see the vents that lay over both shoulders front and back for a bit of airflow, as well as typical beading of water during a steady downpour. Overall I am very impressed with the quality and waterproofing properties of Atlas Gore Active jacket. This is a jacket that I will bring along on Spring, Fall and Winter days where I expect the weather to be lousy or already is lousy when I leave the house, or in summer above treeline on the higher peaks when I want maximum protection for the lightest weight, as it easy compresses tight enough to fit in my running vests. 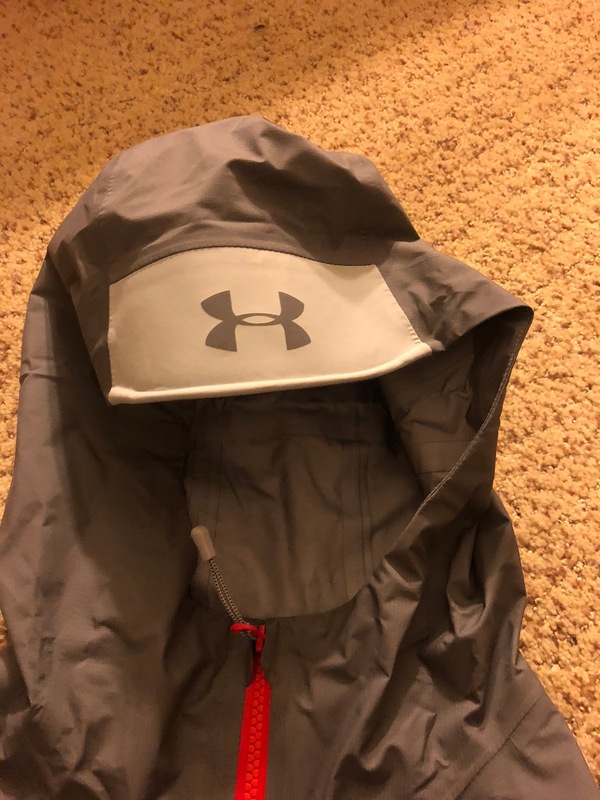 Under Armour Atlas Gore Active vs. Gore Tex Active Run Jacket - The UA Atlas is a bit more substantial and protective, full featured, is longer in the waist and stays put in wind, where the Gore Active Run tends to ride up in the wind. The Gore Active Run however is less than half the weight and offers pretty comparable rain protection. 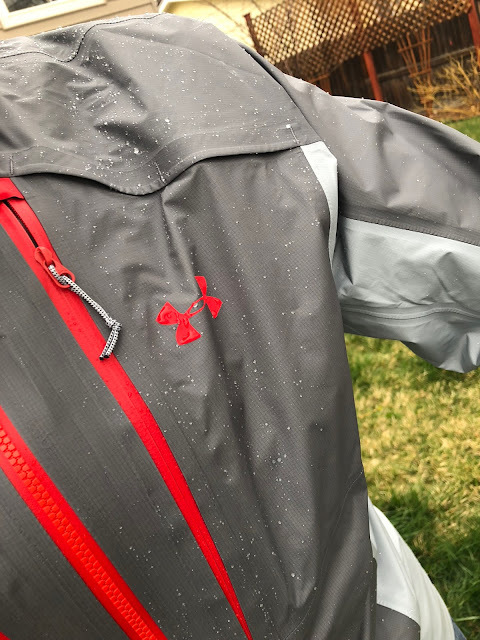 Under Armour Atlas Gore Active vs. Columbia Outdry Extreme - The Outdry is $100 less, is a little lighter, has similar, if not better waterproofing properties and has a more accommodating fit for layering or casual use. The Outdry however only has one pocket and crinkles like a potato chip bag. See our round up review of 2018 waterproof breathable run jackets here. See our review of the companion UA ColdGear Reactor Exert jacket here. This jacket is pretty expensive for a rain jacket. But great review by Jeff and Sam.